As I mentioned in my previous post I also managed to squeeze in a nice little trip to Croatia with my partner last year. We both quite fancied a trip somewhere sunny and relaxing, but were aware that we both get slightly bored just lying on the beach all day, so we wanted to be able to go and soak up a little culture too. We were on a bit of a budget and in all honesty weren’t overly fussed where we ended up, just as long as it was nice. We ended up staying in Cavtat on the Dalmation Coast. Now I’d previously been to Cavtat with my family and I’m not normally one for re-visiting places I’ve been, however, in this case I knew it was exactly what we were after. We managed to get the flight and accommodation without it costing a fortune and just had to hope that the weather was on our side. As you’ve probably guessed from the photos, the weather played it’s part pretty well (mostly… more on that later). Cavtat is a small town about 10 miles or so away from Dubrovnik. It’s small and pretty chilled out, but with a fair few restaurants and a small old town to wander around. It’s also nice and close to Dubrovnik, so in just 40 odd minutes on a boat you can be somewhere new. 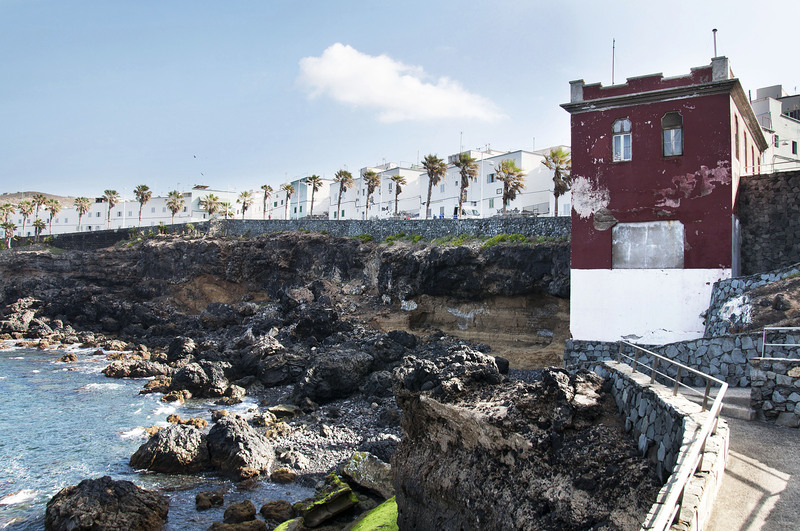 It’s a pretty impressive journey too, hugging the coast as you make your way to the imposing walled city you get some lovely views and can spot small little houses perched on top of the sea cliffs. When you get towards Dubrovnik itself you can start to make out little people walking along the city walls and can get a sense of just how impenetrable it must have appeared back in the day. I’ve heard many people say that photos rarely do Dubrovnik justice, and I’m inclined to agree. The feeling of being there is never going to be captured in photo. After getting off the boat the first temptation is to just shoot off into the back streets and see what you can find, which is exactly what we did. Dubrovnik obviously suffered extensive damage during the Croatian War of Independence but they’ve done a fantastic job of restoring it. There are lots of tiny houses all squashed together within the walls, and it’s hard to believe that people are living in them, but little signs like the washing hanging out of windows proves there are. It’s also strange to think that the majority of the buildings and roofs were damaged, but when you look closely there are differing tile types on the roofs where they had to be replaced. I’m a big fan of cable cars – I think it’s the mix of getting brilliant views, being pretty terrified of heights and having childhood memories of going to the Heights of Abraham at Matlock Bath. It always makes for an exciting journey! Luckily Dubrovnik has a good cable car and it allows you some might impressive views of the Old Town below. As well as looking spectacular from up above, it doesn’t look too shabby from on the ground level either. It really does feel like an old medieval city and if you can get away from the crowds (tricky, but occasionally possible) then it can really feel like you’re in a time warp. I particularly like the little signs of modernity you can accidentally stumble upon, such as the Jägermeister and football net. You can’t really visit Dubrovnik without walking along the city walls. It’s a good way to get your bearings for when you’re back down at ground level, and allows for some good views out into the Adriatic Sea. Despite having mainly good weather, we did encounter a pretty hefty downpour on one of the days we were in Dubrovnik. Never a pair to miss an opportunity we ran to the nearest bar that had shelter and had a sneaky drink. I really like seeing how cities react when it rains. I remember one time I was in Rome and it started to bucket it down, and it was absolute pandemonium. Everyone running for the nearest Metro stop which quickly became uncomfortably crowded, all because of a bit of rain. Dubrovnik handled it in a much cooler fashion, with people whipping out their umbrellas and carrying on about their business (admittedly in a slightly quicker way…). Whilst having our drinks I saw a lot of people holding umbrellas walk past the little alley and thought it would make for a nice photo. As a break from the city sight seeing we went a boat trip that took us around the three main Elafiti Islands, Koločep, Lopud and Šipan. It was a beautiful day and made for a nice change. Lots of fresh sea air, food and wine to have on the boat and even an accidental massive walk up a hill in the sweltering midday heat to find some ruins of an old church (that one was my fault…). We didn’t get a huge amount of time on each island, such is the nature of these boat trips, but it was enough to have a look around and get a bit of a feel for each one. It was great going back to Croatia, and Cavtat is definitely a place I’d recommend staying if you’re wanting to visit Dubrovnik. It had become a lot more ‘touristy’ in the few years between my two visits, but it was still a beautiful place to make your base. The crowds in Dubrovnik can be quite tiring, lots of cruise ship visitors descend on mass and it can be super crowded. Cavtat is a lot quieter, and also considerably cheaper despite having some great restaurants. This place in particular was unbelievable and I would say it deserves it top spot on TripAdvisor. Finally, I’ll leave you with one final reason why Cavtat was pretty special – the evening view from our apartment. In terms of Holidays 2014 was a bit of a treat for me as I managed to shoot away to sunnier climes twice in one year, which is something I’ve not had the luxury of for a while. I managed to get away in the Spring with my Parents to visit my Sister who lives out in Gran Canaria, and I also went to Croatia with my girlfriend for a nice summer break. Both were great and it also gave me a chance to play around with my camera again. I’ve not been great at taking photos recently and tend to just take photos of the bread I make and not much else, so I really enjoyed taking some holiday snaps. Getting away last year has also inspired me to save up for more adventures abroad in the future. I’ve been to a fair few places around Europe but there are many more I’d like to see. Obviously getting out of Europe would be amazing too but that would take a fair bit of saving up – one for in a few years I think! First off was Gran Canaria. I went there in March last year and, as bad as this may sound, was surprised at how nice it was. Whenever I heard of Gran Canaria I tended to think of lairy Brits Abroad. I think the South of the Island is possibly a little bit like that, but my sister lives in Las Palmas which is in the North and is very different. 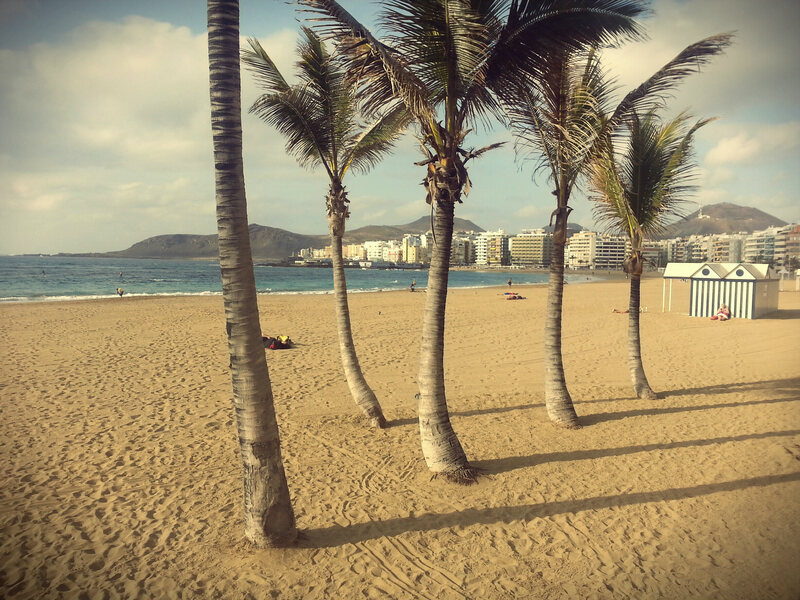 It’s a proper working city so it’s not just people on their holidays, and there is a great promenade called “Playa de Las Canteras”. It was a stones throw from my sisters apartment and a great place to have a wander along in the morning sun. We also hired a car so we could escape up into mountains where there are some spectacular views of little villages set against some pretty imposing rocks. 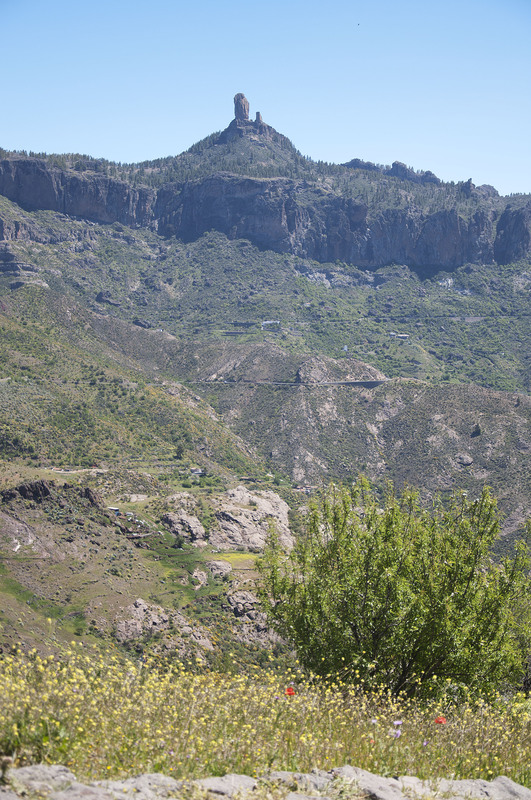 The most famous of which is Roque Nublo, which is this little chap below. 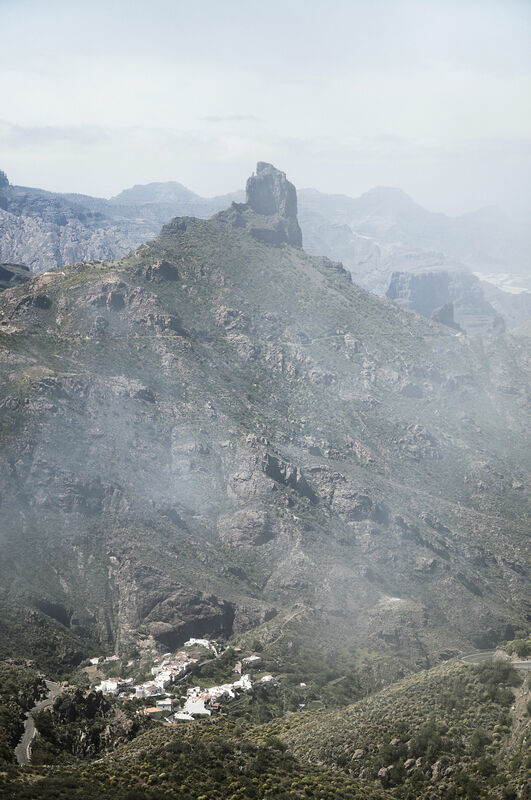 I didn’t know a huge amount about Gran Canaria but I did know it was meant to be dry and dusty. Surprisingly it was actually cool and rainy on a couple of days when I was out there, and had been for a few weeks prior. Not ideal for giving my pasty body a bit of colour, but it did mean that the mountains were a lot more lush than I was expecting. At the beginning of our mountain exploration day I was determined to get some photos, unfortunately as we rose higher and higher the fog became thicker and thicker. 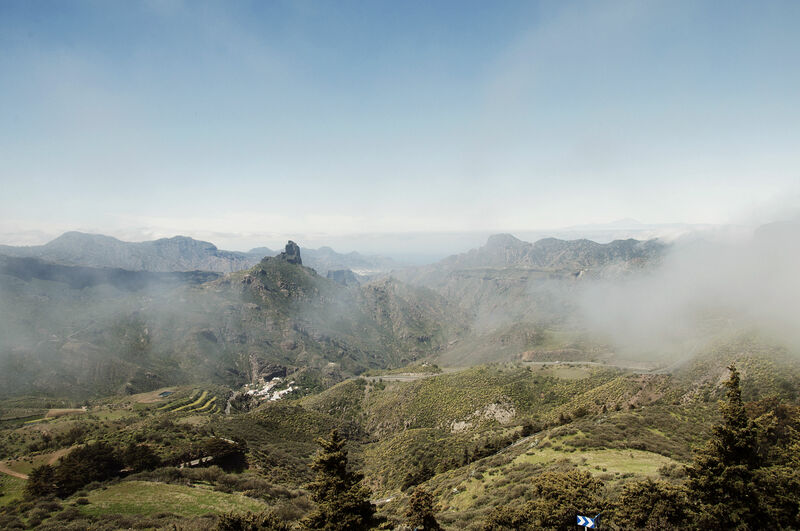 When we arrived into Cruz de Tejeda for a coffee we could barely see 20 meters in front of us. I was wearing shorts and a t-shirt, ready with for snapping away with my camera hanging round my neck and I was bloody freezing! I thought my chance to get any semi decent photos were long gone. 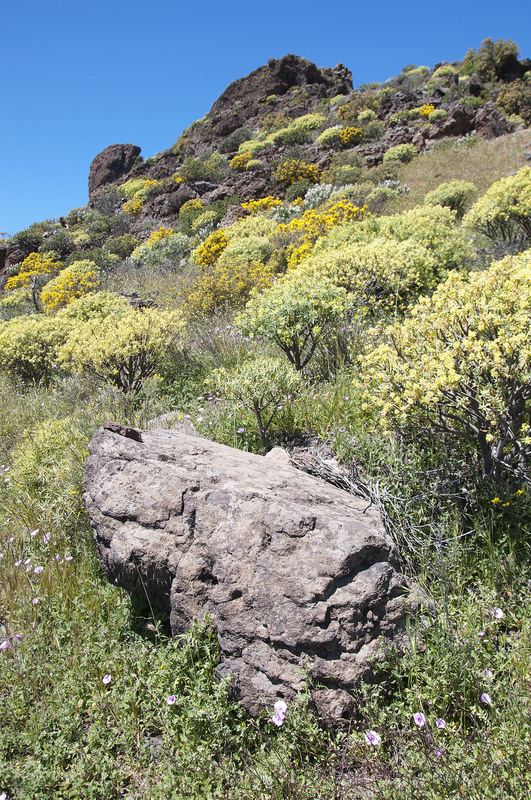 However, as we slowly decended on our way to Roque Nublo we started to see glimpses of green grass and grey rock. Eventually we appeared to be driving through falling clouds, a surreal feeling but unfortunately one difficult to capture in a still image. I did however capture some of the impressive rock formations through the clouds which helped with the atmosphere if nothing else. After escaping the clouds we stopped and looked back and were treated with the view below. For the sense of scale click on the image for the full size. 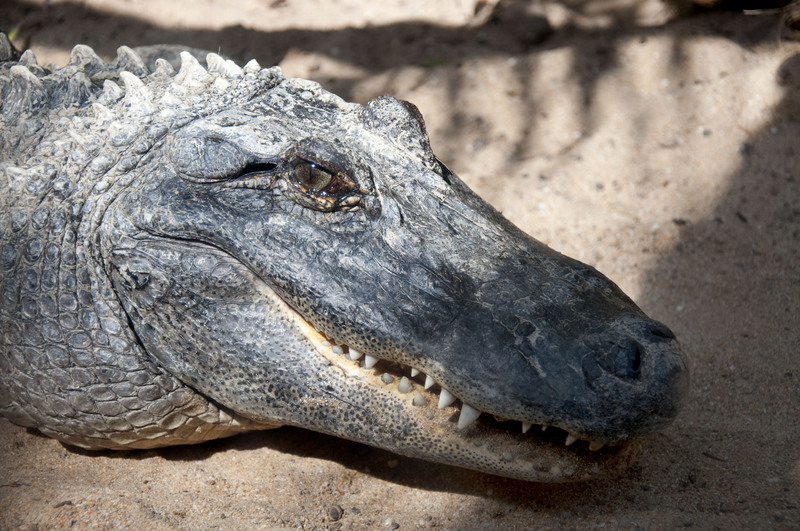 During the time we also visited the Cocodrilo Park. I’m normally quite wary of places with animals kept in captivity, for the pretty obvious ethical reasons. However this one does appear to do quite a lot of good work. 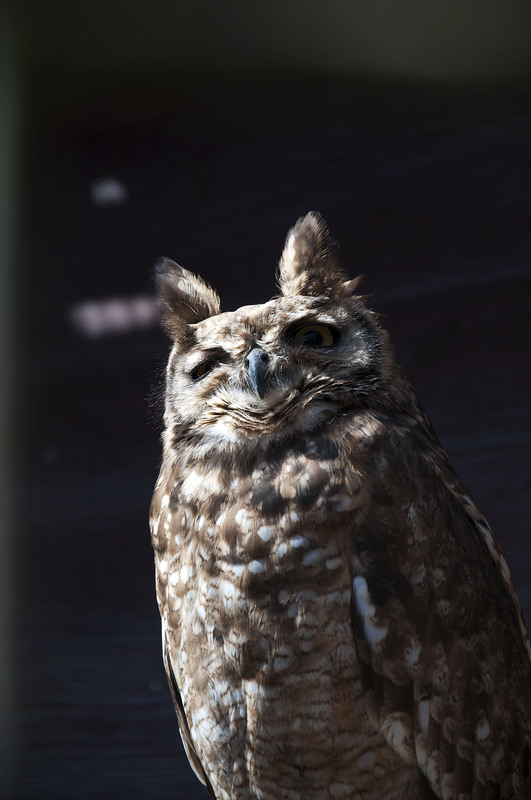 A lot of animals are rescued from captivity by SEPRONA, the Nature Protection Service in Spain. 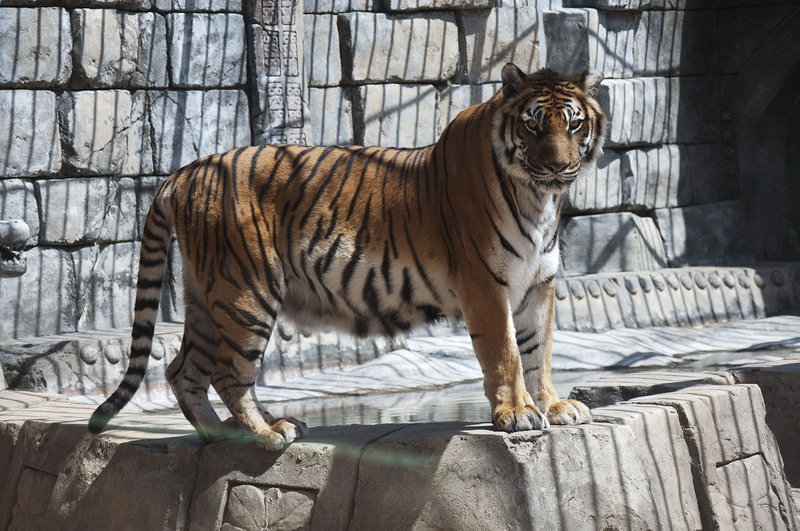 I imagine due to being held in captivity prior to being rescued they can’t be released back into the wild, so they are brought to the park to recover and live. I’m sure it’s not perfect, these things never are, but at least it does some good! 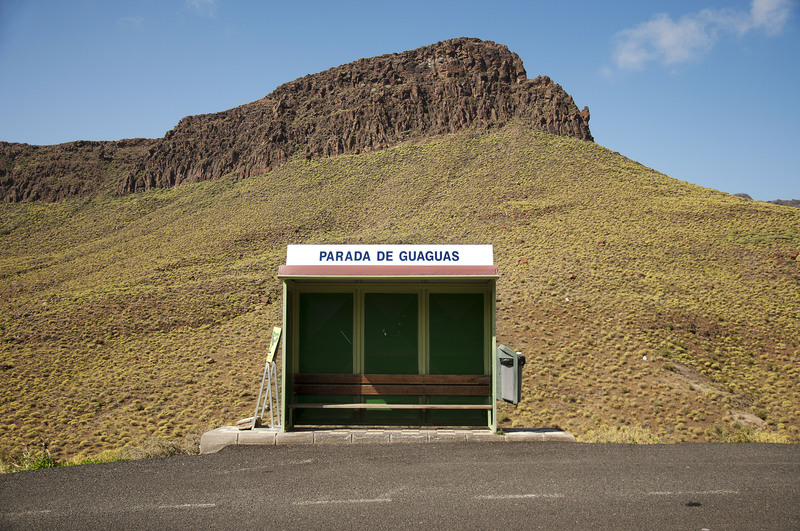 The bus stop for the park was in a pretty impressive location – I liked the contrast of the wild terrain and the mundanity of public transport. 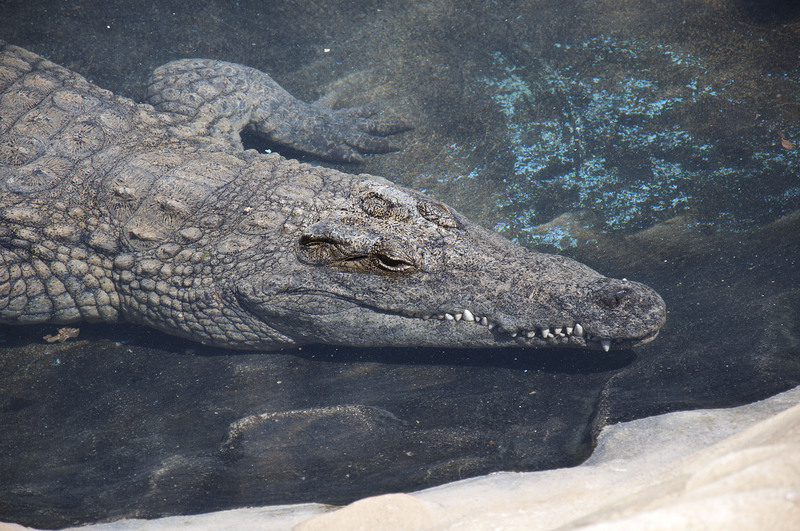 Despite the name Crocodrilo Park they do take in other animals too, although the primary occupants appear to the cold-blooded type. 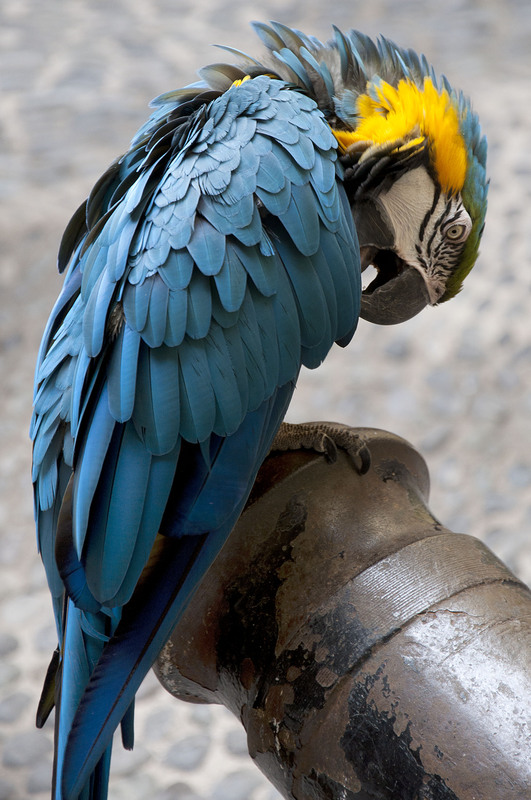 It’s hard not to take photos of interesting looking animals, so I was snapping away during our trip. I couldn’t resist including this guy. We also visited Cenobio de Valeron – a series of caves built into the rocks which were used as grain stores. I didn’t get any particualrly original photos of the caves themselves. A quick google image search will bring up lots of photos though. 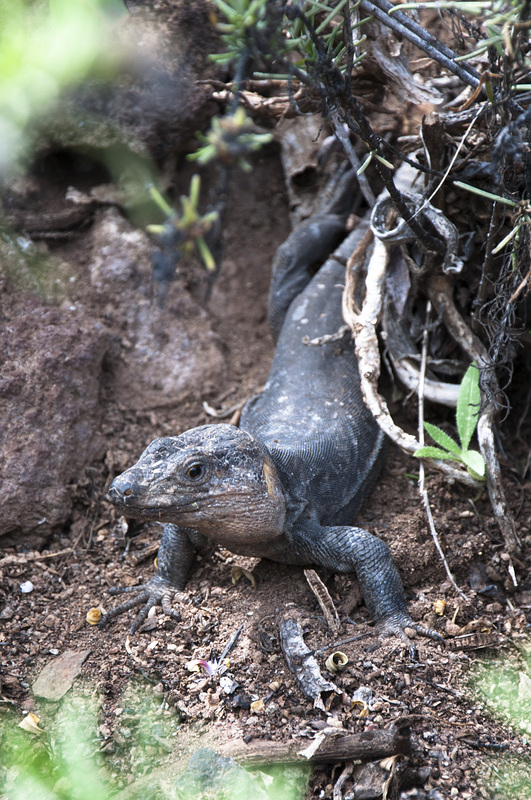 As well as the impressive caves, there were also loads of Lizards – mainly Gran Canarian Giant Lizards. They were huge and because there were so many, lots of oppurtunies to try and get a photo of them. My favourite is the one below, I managed to get within a few metres of this bad boy. All in all it was a really enjoyable holiday and not what I expected at all. I can’t speak for the South of the Island, but in the the North if you can hire a car then you can visit some amazing place and see some spectacular views. So, the 2nd part of my photos of being green. This collection of photos was from a conservation group that I spent a day with, Lothians Conservation Volunteers. This is something that I used to so myself when I lived in Aberystwyth so I knew a bit about it and thought it could make a good subject. The group were really friendly and welcoming, letting me having a cup of tea (check out their amazing kettle further down) and generally just chatting with me. I like the fact that working to help protect our countryside is also a good social outing and as a good as a session in the gym. One of the volunteers was talking about why they do it and pointed out he didn’t do this purely for altruistic reasons, it’s a good way to help with getting fit and you definitely feel better for doing it. I can’t remember what this little beast is called apart from the generic “Wood Cutter” but I really liked it’s hard aesthetic, especially when it was lying the crunchy snow. I know from experience that it is pretty tough work, from chopping down the trees to trying to shift them after you’ve finally got them down. This is the amazing kettle that the volunteers used. The water is in there (somewhere) and they burn some bits of the wood that they’ve cut down during the day, and any scrap paper such as tissues or receipts can be chucked in. As there seems to be snow everywhere apart from the two places where I spend most of my time (Dundee and Edinburgh) I thought I’d dig into my old photos and find some that I took during the terrible weather a couple of years ago. This led me to find a collection of photos I took as part of my course around that time. As part of the course we got to choose a subject to document as part of our documentary photography module. I decided to do mine on being green. Many years ago I studied Countryside Management, which with hindsight was probably not the best choice for a suburban 18 year old who had an idealistic attitude towards the subject but very little experience or knowledge… Saying that I did enjoy the course, it was very interesting and I met some lovely people. So many years later I’m still interested in conservation and the general idea of ‘being green’, and like many people I do find it difficult but I try my best. My original idea was to do a documentary that looked into the connection between money and the ability to be environmentally conscious – it’s much easier to buy ethically sourced food when you’ve got lots of money to do so, it’s a bit more difficult for those living on the breadline. In the end I decided that this would be a very difficult idea to photograph effectively, especially as a student in their first year of a photography course! So I’m going to post a few different sets of images over the next few weeks, rather than lump them altogether as I did originally. This first collection is from the The Hermitage of Braid. This is a great little nature reserve that is just out of Edinburgh and the Edinburgh Ranger Service cover it. I was drawn to it because it was an area where the trees are carefully managed. A lot of work is done to remove non-native species and encourage the growth of native trees in an effort to improve the biodiversity. This can look fairly alarming as you can wander through the area and see piles of logs beside the path and areas where trees are being felled, but in reality it is all done to help keep the area healthy and help the local flora and fauna thriving. This was my favourite shot of my trip out there. I wanted to get a shot of the piles of trees that had been chopped down, but also capture the beauty of the area itself. I like the contrast between the fairly ugly sign with the chopped down trees against the winter wonderland background and the almost symbiotic relationship between the two. As discussed in my previous post I went on a trip to Paris. Which was nice. As well as our stock photography we also had an exhibition whilst we were out there so had to get a suitable photo during our stay. I didn’t want this to be a foody shot (might look at a bit out of place) so I set out to get something else! I’ve got the final one we decided upon for the exhibition here but I’ve also included a few different ones that I had narrowed it down to but that weren’t chosen in the end. This sleepy man was in the Cour Carrée which is a courtyard right next to the Louvre. I felt a tad awkward trying to get a shot and was worried he’d wake up to some annoying tourist pointing a camera at him. Luckily he was deep in slumber and I managed to a few photos, this one being my favourite. We were at Paris during parts of the French election so there were lots of posters of the various candidates. These included the fairly infamous Nicolas Sarkozy. This was initially a possible photo for the exhibition but was deemed too controversial for the relatively conservative college. It’s very rare that the things I do are controversial so that was a bit different! That aside I think it highlights a common feeling towards Sarkozy during the time of the election (even they have been rather extreme in their comparison). Finally whilst on the Pont de l’Archevêché this happy couple came along with a bottle of champagne and a couple of glasses. I’ve no idea what they were celebrating but even I briefly battled through my cynicism and thought it was actually pretty sweet… For a few minutes anyway. I normally hate taking photos of people in these situations as I’m pretty reserved and don’t like intruding, but they were obviously not the shy types since they were celebrating in such style in a tourist hot spot! 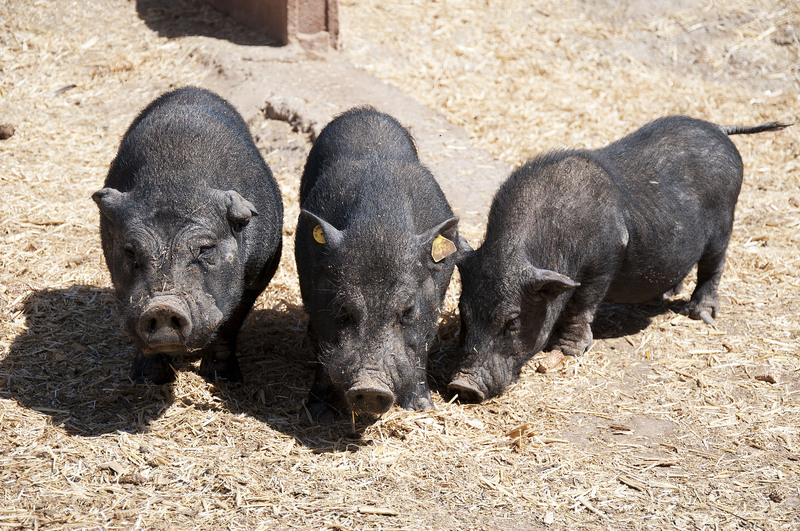 I wandered over, took a couple of photos and they looked over and smiled, seemingly more than happy with the attention. Earlier this year I was lucky enough to go on a paid trip to Paris as part of my course! I was pretty chuffed. It was a really good experience, if slightly stressful (having your photos metaphorically ripped to pieces puts a bit of a dampener on things) but I appreciate it was to encourage us to keep getting better photos. The trip was part of our ‘Stock’ photography module, so photos that would be suitable for a stock library. I predictably chose to do mine on food and drink in Paris. This may have actually been an excuse to go around stuffing my face but I did manage to get some photos I was happy with in the end. Picking photos to submit for the module proved to be a bit tricky. I really liked some photos that were actually not very suitable for stock, and ones that I really wasn’t keen on ended up being suitable. I just had to get over my personal taste and think about what would be suitable for a stock library. So here are some of the photos I took for food and drink in Paris! I’ll add some more (non foody ones) at a later date. I imagine you can’t bloody wait! One of the days I found myself alone and I found a little Turkish place selling really nice flatbread wraps but I cannot remember where I was when I found it! (I spent a lot of time getting lost and just wandering around). These few are from the Richard Lenoir Market near our hotel in the Bastille area of Paris. I think they are maybe slightly generic but they’re ok.
Our college was twinned with another one out in Paris and as well as teaching photography they also had a large kitchen for training patissiers. I spend a morning with my friend Katy watching some of the students whilst they were cooking and they were amazing. They also allowed us to have a little bite when they had spare bits of cake which made it a worthwhile morning in itself. These were taken during that morning. And these are from the various food stalls that caught my eye! It’s December, so in my simple little mind that means it is officially Winter (seasons are strictly split into 3 month periods… obviously). As it’s December I thought I’d pop up a few Wintery photos that I’ve taken in the past and then left them to gather electronic dust in the depths of my hard drive. Here is the Edinburgh German Market a few years ago. This years market has fairly recently appeared, so lots of pastries and mulled wine are in order! These two are from a wander around Edinburgh when the snow was particularly heavy two years ago.